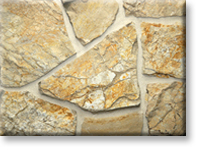 Description Autumn Creek Petite European Castle Stone is a bluish gray bodied stone that has a wide variation of brown and gold tones to a dark burgandy color guillotined into squares and rectangles ranging from 6"x6" up to only 12"x12". Thickness is 3"-5". This material is also available in a thin veneer. Application & Use Residential or commercial applicatoins for paving walkways, patio entries, floors, decks driveways; veneer for interior or exterior walls, columns, fireplace faces, chimneys, barbecues, planters, swimming or natural pools; capping of walls, seats, stair treads, lampoposts, column cap, pool and spa coping, water tables, and sills, etc.